Toronto has plenty of joints to grab a Jamaican patty on the go or eat jerk chicken with rice and beans (Salut! The Real Jerk). But is more savour-the-moment Jamaican dining possible without following the sun down south? It is now, with the opening of Chubby’s Jamaican Kitchen in the King West ‘hood. 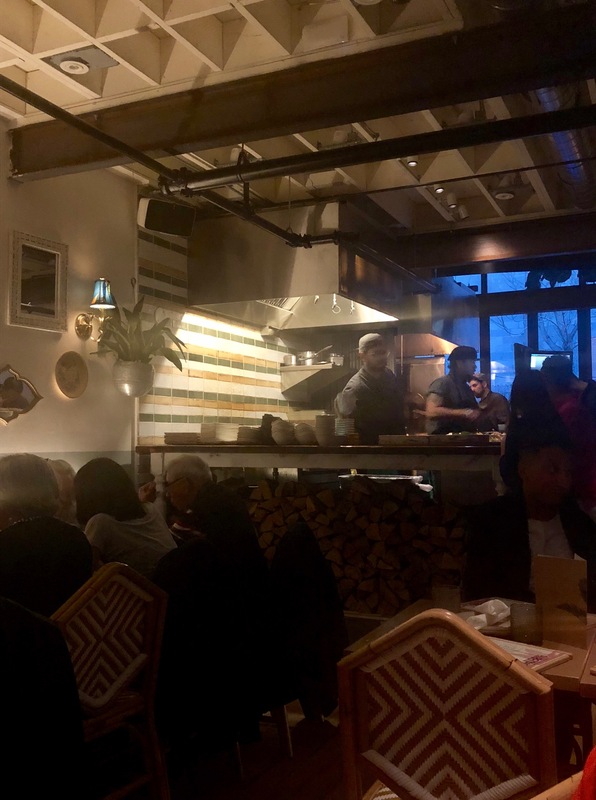 Chubby’s is the brainchild of Janet Zuccarini (Gusto 101, Gusto 54, Trattoria Nervosa, L.A.’s Felix) and it offers easy, breezy island cuisine in the heart of downtown Toronto. 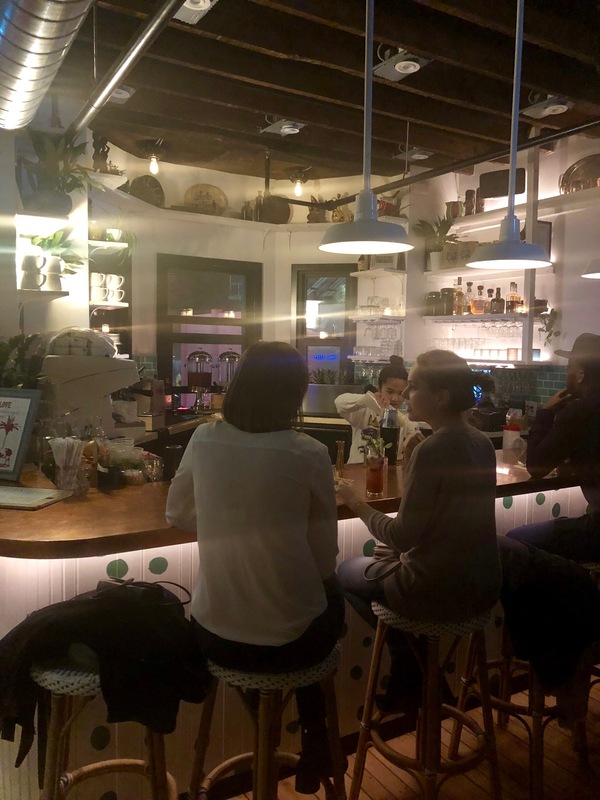 I was skeptical about its authenticity, especially after the restaurant received some questionable press; however, I decided to check it out after hearing rave reviews from some fellow foodies. 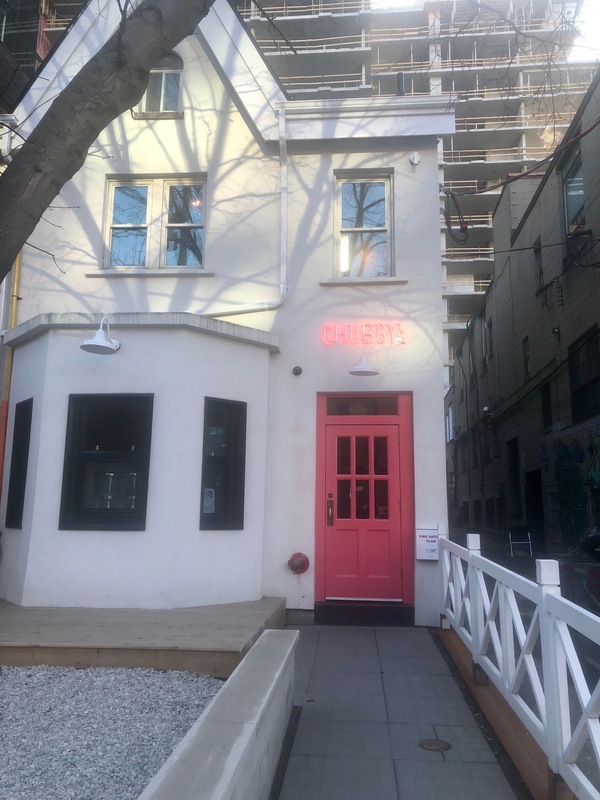 Situated in a snow-white house with a neon pink sign on Portland Street, you’d never expect a steamy, tropical resort-like setting behind its pristine exterior. Rattan chairs, exposed wood beams, palm trees and splashes of island colour made the space feel like a balmy getaway. And amidst Toronto’s never-ending winter, it was a welcome reprieve! Upon walking in, everyone seemed chilled out and relaxed. Reggae beats, old school Bob Marley and ’90s rap were on high volume. Staff were dancing and laughing. The impression that counted most, though, was the intoxicating scent of spices and grilled meats. Open kitchen and jerk pit grill. Those enticing aromas emanated from a soulful assortment of food, prepared by executive chef Elio Zannoni (Gusto 54) and chef de cuisine Donavon Campbell (Angus Glen Golf Club). Just one look at the menu and I was salivating. Traditional Jamaican dishes, such as ackeeand salt fish, patties and jerk chicken were prominent; however, I would have liked to see some buttery, sweet coco bread. The chefs exercised their culinary creativity with dishes such as coconut herb-crusted sea bream ($25) and Chubby’s Burger ($18)—a jerk-infused variety topped with sweet mango salsa. Our server, Jahmal, greeted us like we were old pals. He was extremely knowledgeable and attentive without making us feel rushed. After all, we were on island time, mais oui? What I loved most was his melodic voice and the way he moved rhythmically from table to table. He lifted our spirits and helped transport us to the Caribbean, if only for a few hours. 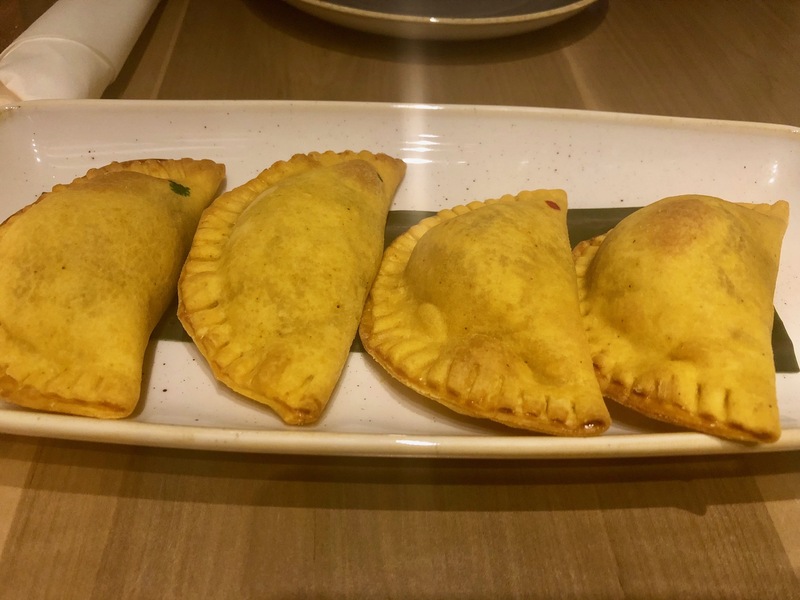 From the “Likkle Bites” section of the menu, my guest and I shared the Jamaican patties ($10). 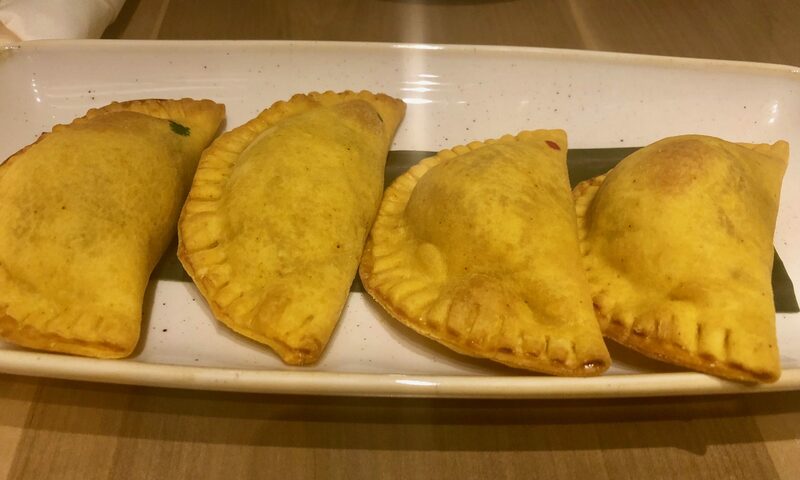 The generous portion of four patties was encased in sunshine yellow pastry—a perfectly flaky texture that needed no improvement. Biting into the patty was an out-of-this world experience. It split into layers, revealing the perfectly puréed filling of curry turkey and coconut greens. A combination of allspice and chopped Scotch bonnet peppers punched up the flavour profile, and a splash of vinegar tempered the fattiness. 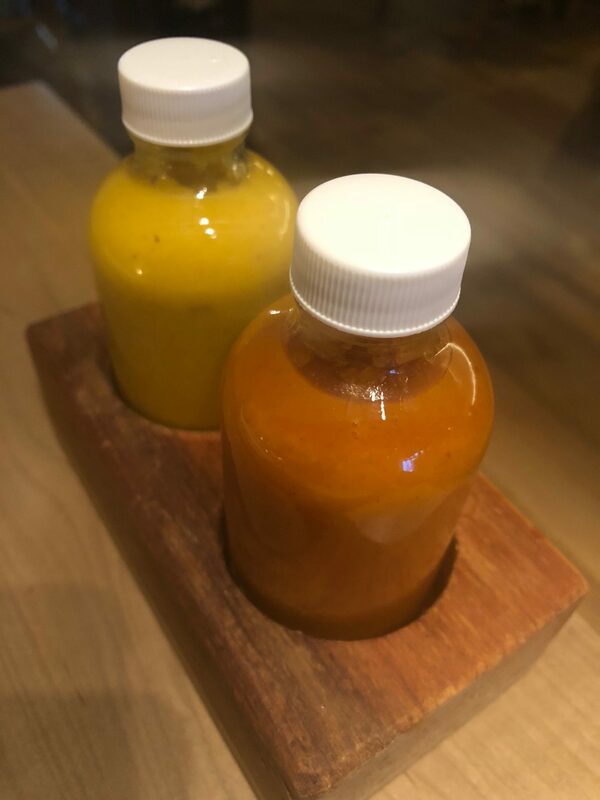 House made sauces were the perfect pairings, but could have used more fire. The food kept getting better. Next up were two dishes from the “Big It Up” section of the menu—curry chicken ($16) and grilled shrimp wraps ($19). The savoury curry had been stewed so long that the tender meat practically melted in my mouth. The accompaniments of papaya chutney, shaved coconut and jasmine rice balanced the flavour profile, which was punctuated with Scotch bonnet. The sauce was rich in taste and a deep brown hue—evidence that the meat had been marinated slowly and cooked until dark. 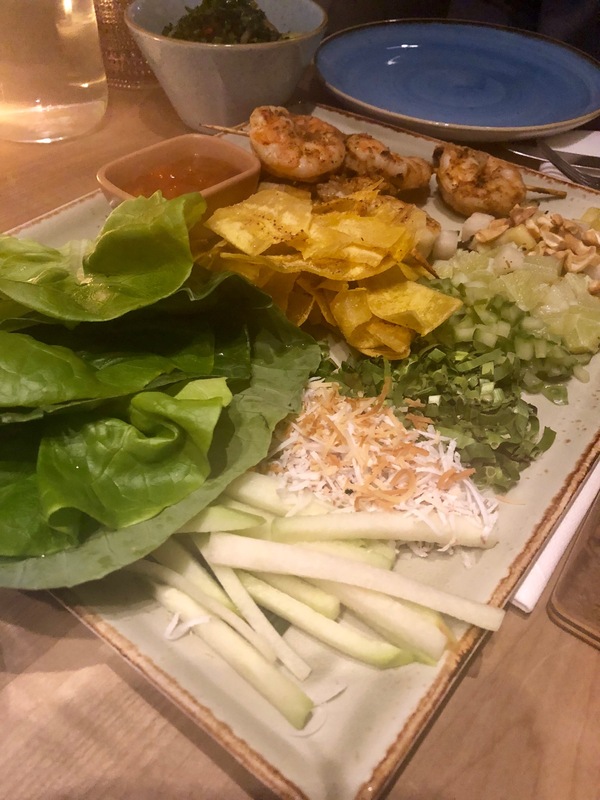 J’adore dishes that are interactive—and the grilled shrimp wraps satisfied my need to play with my food. Served on a platter almost as big as the table, the colourful spread of lettuce and collard greens, pineapple-jicama salsa, cho cho (an edible plant in the gourd family), papaya chutney, and shaved coconut immediately ignited my senses. I would however have steamed the collard greens instead of serving them raw, since the fibrous texture made them difficult to chew. The fiery pièce de résistance was, to no one’s surprise, the jerk chicken (starting at $14 for a quarter chicken). The meat was marinated for days in heat-fueled seasonings before being grilled on the jerk pit. 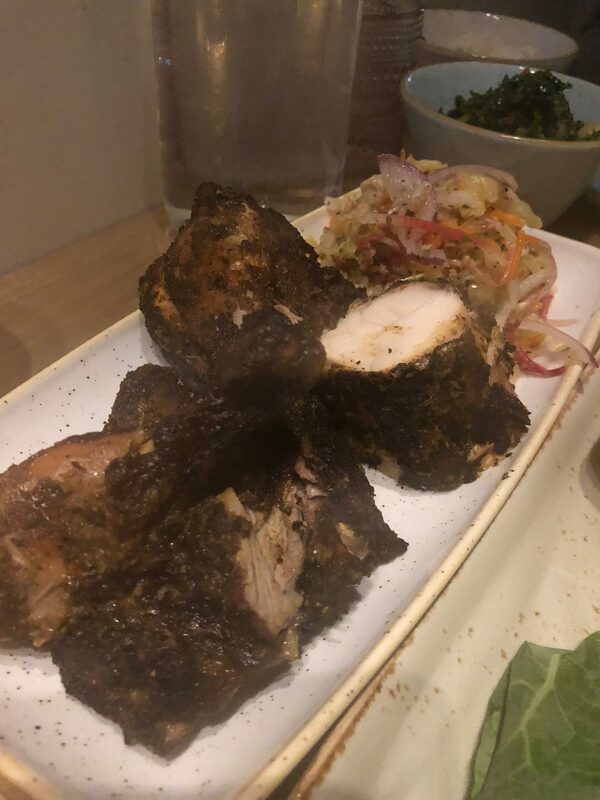 The first bite of the crisp, skin-on poulet had the incendiary sear of true jerk — hot as heck and slightly smoky. Thankfully, it was paired with a cooling heap of Chubby’s slaw. While the slaw was zippy in taste, it was soggy instead of crisp in texture, convincing me that it was left over. I much preferred the side of seasonal greens ($6.50). After our incredible entrées, we had to try something from the “Sweet Tings” section of the menu. 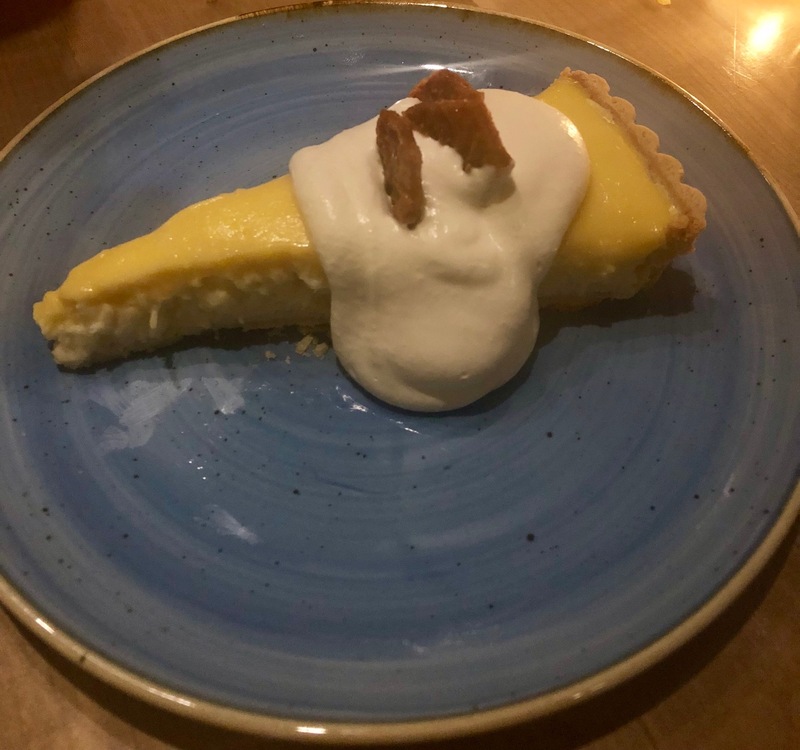 Instead of a basic sundae ($10) or rum-infused bread pudding ($10), we opted for the passion fruit coconut cream pie ($10)—and didn’t regret it. While the pastry was far too thick for a pie, the inside was velvety and creamy with a hint of passion fruit in every forkful. It was the perfect way to end our Chubby’s experience…before rolling out the door. 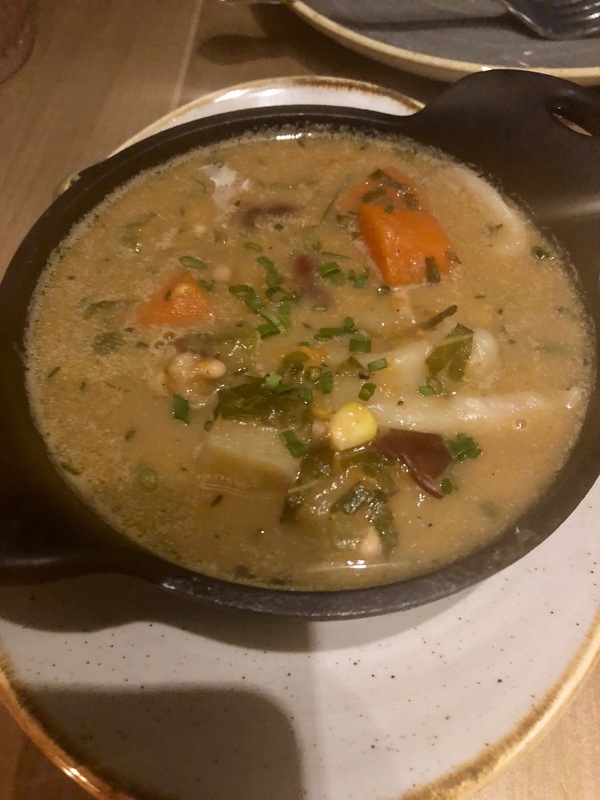 Dining at Chubby’s conjures up Jamaica in every way, and it’s well worth the experience (at a decent price point, too). It was like a therapeutic escape from the frenetic Toronto pace. I can’t wait to come back and try the rum punch and burger on the patio this summer.